Practically everyone, young and old, knows what a French kiss is. Why? Because French kissing is an amazing feeling when it’s done right. It’s a phrase that is understood in almost every country, and every language. Did you know that even the Spanish refer to it as a “Beso francés”? Read on to learn more about this key to French passion. What is French kissing? In technical and extremely non-romantic terms, a French kiss is when “the tongue of one person touches the lips, tongue or inside of the mouth of the other person.” However, anyone who has experienced the joy of kissing someone they care about, understands that kissing is so much more than just touching another person’s lips with yours; it is a sensual and extremely intimate activity. So, where does the phrase “French Kiss” actually come from? Was it really born in France? Or did the French lovers just get credit for something based on their reputation as world-class seducers? To unlock the answer to this mystery, let’s take a closer look at where French kissing originated. There are various theories, but one thing is certain: common, everyday kissing is something we learned from watching other animals. 1. Male reptiles lick female reptiles to flirt with them and let them know that they found them “as attractive as last night’s dinner.” Charming. 2. Birds “kiss” each other to pass chewed-up food from one mouth to another. Yummy. Both are super appetizing, right? Okay, so how did the sight of reptiles licking and birds sharing food start something that would end up being such an important, intimate, and ubiquitous activity as french kissing? 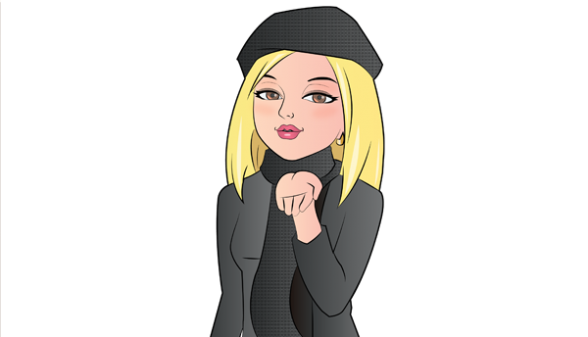 It seems that the French sexual liberty, or at least their perceived sexual liberty, is behind the expression “French kiss.” The term originated in the early 1900s. American soldiers who were stationed in Paris during the First World War were thoroughly impressed by how open the French were about their sexuality. The French population’s natural ease, combined with the beauty of Paris, its attractive women, food, wine, and culture understandably marked these soliders’ lives. When they returned home, they coined the expression “French kiss” to describe the passionate kisses they saw in France, and the name has stuck ever since. So, just as our ancient ancestors invented kissing from observing animals, Americans learned how to kick kissing up a notch by observing the passionate French. 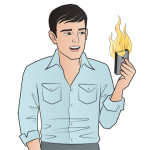 then check out TEXT WEAPON – French Seduction Made Easy.  This eBook contains an entire chapter devoted to message templates and ideas explaining how you can seal your next text message with a kiss that your partner will remember for a long, long time.